Osceola High in Seminole is one of a kind in Florida. It’s Florida’s first and only fundamental high school. SEMINOLE, Fla. — It looks like most other high schools in Tampa Bay, but Osceola High in Seminole is one of a kind in Florida. 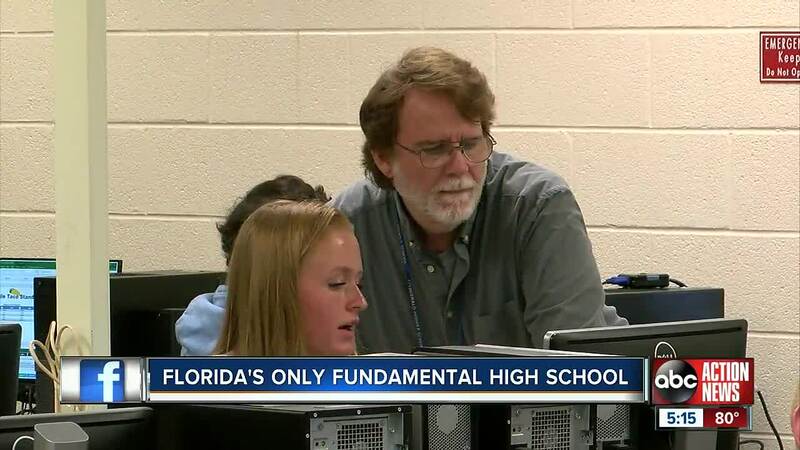 It’s Florida’s first and only fundamental high school. “It’s a very rigorous program. We raise the bar. If a student starts here, we want to try and get them up to this point before the end of the year,” said principal Michael Bohnet. The fundamental structure centers around parent involvement. There are mandatory meetings with teachers every month. Parents even have to sign homework assignments. “It keeps them involved with the school and lets them know what we are doing,” said senior Brandi Bottger. There are high expectations for behavior and self discipline, and a stricter dress code. “It’s just an overall friendly environment because everyone wants to strive to be that better student and it’s good friendly competition as well,” said student Tyre Hill. The curriculum includes a focus on engineering, IT, culinary arts and video production. “You are going to be pushed by teachers. You can are going to be pushed by your peers. And everybody is just trying to make you a better student as well as just a better person,” said senior Benjamin Allen. 75% of Osceola students go on to higher education and the school has a 98% graduation rate. It’s also been graded as an A-school for seven straight years. There are three fundamental middle schools in Pinellas County. They act as feeder schools to Osceola. Those students have first choice to get in. Others can apply from anywhere in the county.